I've been lucky to be in the pipeline for a number of big-budget features from China. You remember China? Not the lady wrestler but that giant, oft-underestimated country all the way around the world that now makes all our stuff? China probably even prints lots of "BUY AMERICAN" stickers for US clients now seeking the jobs done more quickly and cheaply than local labor; I wouldn't be surprised. I hear media populist pundits now and then say that China's actually in deep recession, backsliding into backwardness, no longer a major player in the world economy. That strikes me rather as whistling while walking past our own graveyard, if you know what I mean. Sort of like the way that Cleveland sports fans still pretend we have a hope of a championship one of these years. Yes, maybe it will happen, maybe it won't, but if China emerges as the dominant superpower of the 21st century, surprise winner of the Cold War, while Russia and America collapse inwards of their own rottenness, well...that would appeal to my affection for a well-plotted Hollywood ending. And, on that note, I am seeing more and more of western mass-entertainment influences on the cinema of the Peoples' Republic. It brings mixed emotional reactions, in a way. The austere, artfully composed, meditative work by the likes of Zhang Yimou and Chen Kaige (rendered, it must be said, under heavy Beijing Communist Party censorship) gives way to unrestrained, mass-audience crowd-pleasers - as filled with CGI and stunt kitsch as any Hollywood flick (who pilfered freely from Hong Kong action hits of the last several decades anyway, so there). I mainly find this quasi-Americanization of the Far East arts fascinating as an indicator of the Chinese giant flexing its cultural muscles. This is what movies look like coming from a nation on the ascent, I feel. 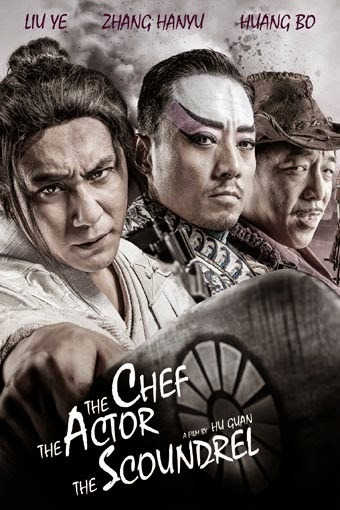 This week's example: THE CHEF, THE ACTOR AND THE SCOUNDREL. Filmmaker Hu Guan's big-budget action-comedy-thriller-action-war pic (so much action that I had to put "action" in there twice) that could have been slapped together by any number of Yankee-barbarian studios with their audience focus groups. The Second World War yarn starts out like Stephen Chow slapstick, all cross-eyed mugging and wide-angle lenses. Setting in occupied China under the haughty jackboot of the Imperial Japanese - though both sides are suffering in a deadly cholera epidemic. Two of the Japanese, members of a notorious germ- warfare unit (one that really existed, whose ghastly human experiments were depicted in the infamous Far East sleaze-sploitationer MEN BEHIND THE SUN), are captured by `the scoundrel,' a bandit attired and behaving just like an American cowboy. The desperado takes the pair to a restaurant run by a craven collaborator chef, who along with his moronic, mute wife, specialize in serving Japanese cuisine to placate his country's conquerors. There, along with a pretentious Peking Opera actor who happens to be hanging around, the Chinese squabble about how to ransom their Nippon hostages for the most money. But hold it there for just a second. Flashbacks reveal that the buffoonish, idiot captors are actually brilliant resistance-fighters and microbiologists. By role-playing as greedy imbeciles - which is how the Japanese view all Chinese - they hope to trick the enemy into revealing a vital cholera vaccine. Thus a neat trick of watching stuff happen the first time in high-speed DUMB AND DUMBER farce mode - than see it again as circumstances really are, with the clever Chinese secretly hand-signaling to each other, or rehearsing behind hideout walls the next mind-game torment they plan to inflict on the invaders. Although, in the background, lurk a couple of Chinese malcontents who actually ARE selfish, greedy imbeciles. They spy on all this happening from a distance and meddlingly try to get a piece of the supposed profits themselves (at least it confuses the Japanese further). As the tangled plotline goes on, material takes jagged detours into action-patriotic territory. Our Mandarin heroes start tearing into surrounding Japanese legions Rambo-style, with much video-game fake digital bloodletting. The viewer starts feeling a bit like a sense-battered POW, and the thing seems to have at least two epilogues too many. But, lest the viewer miss the ultimate point about Chinese `exceptionalism,' a Japanese at one point asks one of the underground freedom-fighters if he's unusually smart for a Chinese. Remember now, our heroes are multi-lingual, martial-artist doctors, scientists and engineers, with superhuman abilities to think on their feet, make Sherlockian deductions, doubletalk circles around the nemesis, prepare savory meals, and interpret chemical formulae and Morse code (simultaneously). No, the Chinese says. If anything, I'm a little below average. Sheesh! And America's left-wing critical establishment thought John Wayne was full of himself. Still, when it's consistent with the madcap Lend Me a Tenor-meets-Noises Off and cranked-to-eleven comedy, THE CHEF, THE ACTOR AND THE SCOUNDREL is diverting. Is it 21st-century prole feed, perhaps the equivalent of a patriotic Larry the Cable Guy vehicle directed by Michael Bay? (hey, that could happen) Maybe. But as an example of what's coming out of the dream factories of the world's sudden economic and cultural powerhouse, it's worth a look.